IL-33, a new member of the IL-1 cytokine family, promotes Th2 inflammation, but evidence on the implications of this cytokine in asthma is lacking. IL-33 would be mainly expressed by structural cells, but whether proinflammatory cytokines modulate its expression in airway smooth muscle cells (ASMC) is unknown. Endobronchial biopsies were obtained from adults with mild (n = 8), moderate (n = 8), severe (n = 9), asthma and from control subjects (n = 5). Immunocytochemistry, laser-capture microdissection, reverse transcriptase, and real-time quantitative PCR were used for determining IL-33 expression in the lung tissues. ASMC isolated from resected lung specimens were cultured with proinflammatory cytokines and with dexamethasone. IL-33 expression by ASMC was determined by PCR, ELISA, and Western blotting. Higher levels of IL-33 transcripts are detected in biopsies from asthmatic compared with control subjects, and especially in subjects with severe asthma. ASMC show IL-33 expression at both protein and mRNA levels. IL-33 and TNF-α transcript levels correlate in the lung tissues, and TNF-α up-regulates IL-33 expression by cultured ASMC in a time- and dose-dependent manner. IFN-γ also increases IL-33 expression and shows synergistic effect with TNF-α. Dexamethasone fails to abolish TNF-α-induced IL-33 up-regulation. IL-33 expression increases in bronchial biopsies from subjects with asthma compared with controls, as well as subjects with asthma severity. ASMC are a source of the IL-33 cytokine. Our data propose IL-33 as a novel inflammatory marker of severe and refractory asthma. Asthma is a chronic inflammatory disease of the airways characterized mainly by Th2 lymphocyte-mediated immune responses and associated with bronchial hyper-responsiveness, airflow obstruction, and airway remodeling. This Th2-biased inflammation is associated with leukocyte recruitment and activation in the airways (mainly lymphocytes, eosinophils, and mast cells) and overproduction of cytokines including IL-4, IL-5, and IL-13 (1). Recent studies have reported an increased level of TNF-α specifically associated with severe and refractory phenotypes of the disease (2, 3, 4, 5). IL-33 (also called IL-1F11 or NF-HEV, nuclear factor from high endothelial venules) is a recently described member of the IL-1 family, which also includes IL-1α/β, IL-1Ra, and IL-18 (6). In contrast to other IL-1 type cytokines, which mostly drive Th1 immune responses, IL-33 is currently described as a promoter of Th2 immunity and systemic inflammation in both in vivo models and in vitro experiments (7, 8). Administration of rIL-33 to C57BL/6 mice is associated with increased IgE and IgA serum levels, splenomegaly due to infiltration by eosinophils and plasma cells, and increased blood eosinophils and lymphocytes as compared with PBS-treated mice (7). IL-33 induces expression of Th2 cytokines and is associated with mucus overproduction and goblet cell hypertrophy in the lungs and the gastrointestinal tract (7). Recently, Hayakawa and coauthors reported up-regulation of IL-33 mRNA in the lungs of an allergic airway inflammation mouse model (8). Cytokines of the IL-1 family are reportedly produced by cells of both hematopoietic (monocytes/macrophages) and nonhematopoietic origin (endothelial and epithelial cells). Screening of cDNA libraries suggests that human IL-33 gene is mainly expressed by structural cells of various tissues, including fibroblasts, airway smooth muscle cells (ASMC),3 and endothelial and epithelial cells (7, 9). The IL-33 mRNA expression in cells from the libraries also appeared likely to be influenced by the inflammatory milieu, especially after activation with TNF-α and IL-1β (7). Recent studies describing the roles of IL-33 regarding the induction and maintenance of Th2 inflammation (7, 10, 11, 12) reveal a lack of data on the expression and regulation of IL-33 in human cells and tissues, especially in the context of human Th2-type diseases like bronchial asthma. We hypothesized that the lung tissues from subjects with asthma exhibited an increased expression of IL-33. We also hypothesized that airway smooth muscle cells were a source of IL-33 and could be used as a model to study IL-33 expression and its modulation under inflammatory/anti-inflammatory conditions. This study reports that IL-33 is expressed at higher levels in human endobronchial biopsies from asthmatic subjects compared with healthy controls and is refractory to the effects of corticosteroids. These data support the potential role of IL-33 in the pathogenesis of asthma, particularly that of the more severe phenotypes. The pharmacological inhibitors dexamethasone 21-phosphate disodium salt (DEX) and mithramycin A (MMA) were purchased from Sigma-Aldrich and resuspended in water. The neutralizing Ab against ST2, as well as all human recombinant cytokines except IL-33 (Alexis Biochemicals/Axxora) were purchased from R&D Systems. Subjects with well-defined moderate and severe asthma were recruited from the Montreal Chest Institute and Sacré-Coeur Hospital (Montreal, Quebec, Canada) based on the criteria of the American Thoracic Society workshop for Refractory Asthma (13, 14). Subjects with mild asthma (14) and control subjects were recruited from the Montreal Chest Institute. Detailed definition of the inclusion and exclusion criteria for the enrollment of asthmatic subjects were reported previously (15). The protocols for the study were reviewed and approved by the ethics committees of both hospitals, and informed consent was obtained from all participating subjects. Bronchoscopy was performed under light sedation. Six endoscopic bronchial biopsies were obtained from the right lung at various segmental and subsegmental carinae using a biopsy forceps with a fenestrated cup (Olympus biopsy forceps 35C; Olympus Medical Systems Corp). Tissues were fixed in formaldehyde and embedded in paraffin before 5-μm-thick sections were cut on a microtome. Staining was performed using a peroxidase-based method as previously described (16). Briefly, sections were deparaffinated in xylene, dehydrated in ethanol, and washed in PBS. Ag retrieval was performed by boiling the sections in a 0.01 M EDTA buffer (pH 8.0) for 2 min. Sections were cooled in tap water before a successive permeabilization step (with Triton 0.2% in PBS) and hydrogen peroxide (5% in PBS) immersion. The sections were then washed three times for 5 min in PBS before incubation with a universal blocking solution (DakoCytomation) for 30 min. Tissue sections were immunostained with mAbs for human IL-33 (mouse IgG1κ (Nessy-1); Axxora) at a concentration of 0.01 mg/ml. The secondary Abs raised in rabbit (DakoCytomation) were applied at concentrations of 1/100. To confirm specificity of the IL-33 Ab, sections were also stained with a mouse IgG1κ isotype control Ab and a primary anti-IL-33 Ab was preadsorbed with a 5-fold mass excess of the immunizing peptide (human IL-33 recombinant protein; Alexis Biochemicals) for 1 h at 4°C. The immunostains were developed using StreptABComplex/HRP and diaminobenzidine substrate as per the manufacturer’s instructions (DakoCytomation). Slides were examined and images were acquired by a BX51 Olympus microscope attached to a CoolSNAP-Pro color digital camera (Carsen Group) using the Image Pro-plus 4.0 system (Media Cybernetics). LCM was conducted as described previously (17, 18). Frozen tissue sections placed onto glass slides were completely air dried and desiccated to prevent the activation of endogenous RNase in the tissues. LCM of smooth muscle bundles was performed using the PixCell II system (Arcturus Engineering). The interval between the staining of slides and the completion of microdissection was 1–2 h. After samples were captured on CapSure macro LCM caps, cells were lysed with RLT lysis buffer (Qiagen) and samples were stored at −80°C until RNA extraction. Primary human ASMC were obtained from main bronchial airway segments (0.5- to 1.0-cm diameter) in pathologically uninvolved segments of resected lung specimens using isolation methods described previously (18, 19). Cells were then seeded at a density of 105 cells/cm2 and grown at 37°C with 5% CO2 in smooth muscle growth medium containing SingleQuots providing fibroblast growth factor, epidermal growth factor, insulin, and antibiotics (Cambrex) and supplemented with 10% heat-inactivated FBS. Cell cultures used for this study were grown from passage 2 to passage 6. Under these conditions, 90% of the cells grown at confluence expressed smooth muscle-specific α-actin, SM22, and calponin protein and mobilized Ca2+ upon acetylcholine exposure. Cell viability was always >95% by trypan blue dye exclusion. ASMC were starved in smooth muscle growth medium 2 (SmGM2) containing only antibiotics (starving medium) for 24 h before fresh and cytokine- and/or ST2-neutralizing Ab and/or pharmacological inhibitor-supplemented starving medium were added to stimulate cultures for 4, 12, 24, or 48 h. Cells were lysed with RLT lysis buffer (RNeasy kit; Qiagen), supplemented with 2-ME (Sigma-Aldrich), and samples were stored at −80°C until RNA extraction. Total cellular RNA was isolated by using RNeasy micro kit (for homogenized lung biopsy tissues and LCM ASMC bundles) or mini kit (for primary ASMC cultures) extraction columns (Qiagen). RNA was reverse transcribed using oligo(dT)12–18 primer in the presence of RNAguard (both from GE Healthcare) and Superscript II reverse transcriptase (Invitrogen). Quantification of mRNA levels was performed by real-time PCR using the LightCycler PCR (Roche Diagnostics) and QuantitTect SYBR Green PCR master mix (Qiagen). Relative quantification of the PCR products was achieved using a standard curve obtained by simultaneously amplifying samples with serial dilutions of the amplicon. Results were analyzed with LightCycler software, version 3.5.3 (Roche Diagnostics). Both melting curve analysis and agarose gel electrophoresis were used to assess the specificity of the amplification products, as well as primer-dimer formation. Quantification of mRNA encoding endogenous 40S ribosomal protein S9 was performed as a housekeeping gene and used to correct for variations in cDNA content among samples. The ribosomal protein S9 recently ranked in the top 100 best housekeeping genes (20). Primers were designed to span an intron and the sequences were as follows (5′ to 3′): AGCTCTGCATCGTTTTGGGTT (IFN-γ sense) and GTTCCATTATCCGCTACATCTGAA (IFN-γ antisense); CAAAGAAGTTTGCCCCATGT (IL-33 sense) and AAGGCAAAGCACTCCACAGT (IL-33 antisense); TGCTGACGCTTGATGAGAAG (S9 sense) and CGCAGAGAGAAGTCGATGTG (S9 antisense); and TCAGCCTCTTCTCC (TNF-α sense) and TCAGCTTGAGGGTT (TNF-α antisense) (Invitrogen). PCR amplicons were 118, 180, 307, and 199 bp in length for IFN-γ, IL-33, S9, and TNF-α, respectively. Unless specified, data were expressed as the calculated ratio of the values obtained for IL-33 vs the values of the housekeeping gene S9. In some cases (cell culture studies), data were expressed as a fold increase compared with the ratio (IL-33/S9) obtained for the vehicle-treated or TNF-α-treated cells. ELISA experiments were conducted on ASMC culture medium supernatants collected at various time points during stimulation. Supernatants were spun down 10 min to ensure the absence of cells in suspension and were stored as aliquots at −80°C until used. To quantify IL-33 proteins, the human IL-33 CytoSet (Invitrogen) was used as per the manufacturer’s instructions. Cells were rinsed in ice-cold PBS and incubated in lysis buffer (10 nM HEPES (pH 8.0), 150 mM NaCl, 500 mM saccharose, 1 mM Na2EDTA, 1% Nonidet P-40, and 1% CHAPS) containing a mini complete protease inhibitor cocktail tablet (Roche) for 30 min on ice. Extracts were clarified at 14,000 × g at 4°C for 20 min and protein concentration was determined using the Bradford assay. Twenty-five to 100 μg of protein was resolved by 10% SDS-PAGE and transferred to Hybond-P polyvinylidene fluoride membranes. Blocking of membranes was conducted using 5% skim milk in PBS with 0.05% Tween for 1 h at room temperature. Blots were incubated with rabbit anti-human polyclonal IL-33 Ab or mouse anti-human IL-33 mAb (0.5 or 1 μg/ml, respectively; both from Alexis Biochemicals) and mouse anti-human GAPDH mAb (1.0 μg/ml; Affinity BioReagnents) for 1 h at room temperature. After washing, membranes were treated with HRP-conjugated swine anti-rabbit or sheep anti-mouse polyclonal Ab for 1 h at room temperature. After washing, signal was developed using the ECL Plus kit (GE Healthcare) and the Fluorchem 8000 system (Alpha Innotech). Densitometric analysis of protein signal was performed using the AlphaEase FC software (Alpha Innotech). Jurkat T cells (clone E6-1), HUVEC, and human normal lung CCD-8Lu fibroblasts were all purchased from American Type Culture Collection and grown as per the supplier’s indications in medium (RPMI 1640, F12, and DMEM, respectively) containing 100 U/ml penicillin, 100 mg/ml streptomycin (Invitrogen), and 10% FCS (HyClone Laboratories). Normal human bronchial epithelial cells were grown in bronchial epithelial cell basal medium containing SingleQuots from Clonetics. Nonparametric quantitative RT-PCR data obtained from biopsies are expressed as the medians, whereas data from experiments done on cell cultures are expressed as means ± SEMs. Unless specified, data are representative of the indicated number of subjects or independent experiments. Kruskal-Wallis/Mann-Whitney post hoc tests were performed to analyze differences between data obtained the different groups of subjects with/without asthma. The p values were corrected for multiple comparisons. One-way ANOVA coupled with paired Student’s t tests or Tukey’s tests were conducted for in vitro studies on ASMC. Values of p < 0.05 were considered significant. Spearman’s rank tests were conducted for analyses of correlation. Endobronchial biopsy specimens collected from asthmatic subjects with well-defined disease severity were used to assess IL-33 gene expression by real-time quantitative PCR. cDNA samples from a total of 25 subjects with asthma (eight with mild, eight with moderate, and nine with severe asthma) and six control subjects were studied. Subjects recruited for this study were all participants in a previous study (15). Subject characteristics are presented in Table I⇓. As shown in Fig. 1⇓A, increased levels of IL-33 mRNA transcripts were detected in subjects with diagnosed asthma compared with healthy nonasthmatic controls (left graph; p = 0.006). Subjects with moderate and severe asthma each showed significantly higher IL-33 mRNA expression than controls (Fig. 1⇓A, right graph; p = 0.024 and 0.002, respectively). When these IL-33 transcript data were normalized to the expression of 40S ribosomal protein S9 mRNA (Fig. 1⇓B), the lung tissues from asthmatic subjects still exhibited increased IL-33/S9 mRNA ratios compared with those from controls (left graph; p = 0.030). In agreement with raw transcript data, moderate (p = 0.059) and severe asthma (p = 0.036) groups displayed increased IL-33/S9 ratios compared with controls (Fig. 1⇓B, right graph). There were no significant differences in IL-33 or IL-33/S9 expression between the different groups of subjects with asthma based on severity. IL-33 gene expression in endobronchial biopsy specimens from subjects with asthma. Tissues obtained from a cohort of subjects with asthma and healthy controls were processed for RT-PCR gene expression profiling as described in Materials and Methods. A, Raw IL-33 transcript levels are presented for all subjects with diagnosed asthma (n = total of 25) compared with control subjects (n = 5; left graph) and in subjects with mild (n = 8), moderate (n = 8), and severe (n = 9) asthma compared with controls (right graph). B, IL-33 mRNA data are normalized to ribosomal protein S9 mRNA and expressed as relative IL-33/S9 mRNA ratios; all asthmatics vs controls (left graph) and different disease severity vs controls (right graph) are shown. A and B, In the box whisker plots (left graphs), the line inside each box is the median, upper box border represents the 75th quartile, the lower box border represents the 25th quartile, and whiskers represent the range. Data for individual biopsy samples (right graphs and data in later figures) are presented as individual dots and the lines represent medians. ∗, p < 0.05, representing significant differences compared with the control group. Schmitz and collaborators postulated that IL-33 gene expression, mostly detected in various nonhematopoietic and structural cells, was increased in the presence of proinflammatory cytokines, namely TNF-α and IL-1β (7). However, there is now evidence for an increased expression of TNF-α in asthma, and especially in severe and refractory asthma (3). Lung tissues from our cohort of asthmatic subjects were then used to determine whether TNF-α cytokine mRNA, along with IL-33 mRNA, was also differentially expressed in asthmatic tissues compared with controls. As presented in Fig. 2⇓A, biopsy-derived cDNA samples from subjects with moderate and severe asthma displayed significantly higher TNF-α/S9 mRNA levels compared with subjects from the control group (p values of 0.036 and 0.024, respectively). Interestingly, a slight decrease in the TNF-α/S9 ratio was observed between subjects with moderate and those with severe asthma, although the difference was not significant. Furthermore, a significant correlation was found between both TNF-α/S9 and IL-33/S9 mRNA ratios detected in all asthmatic subjects (Fig. 2⇓B; r = 0.6255, p < 0.0004). Data from control subjects were excluded from the correlation analysis. In addition, the levels of IL-33 mRNA or TNF-α expression in lung tissue specimens from subjects with or without asthma failed to correlate with the patient’s lung function as expressed by the FEV1 (% predicted) value (Fig. 2⇓C; r = −0.1495, p = 0.4221; data not shown). TNF-α gene expression in endobronchial biopsy specimens from subjects with asthma. Tissues obtained from asthmatic subjects (mild, moderate, and severe) and healthy controls were processed for RT-PCR as described in Materials and Methods. 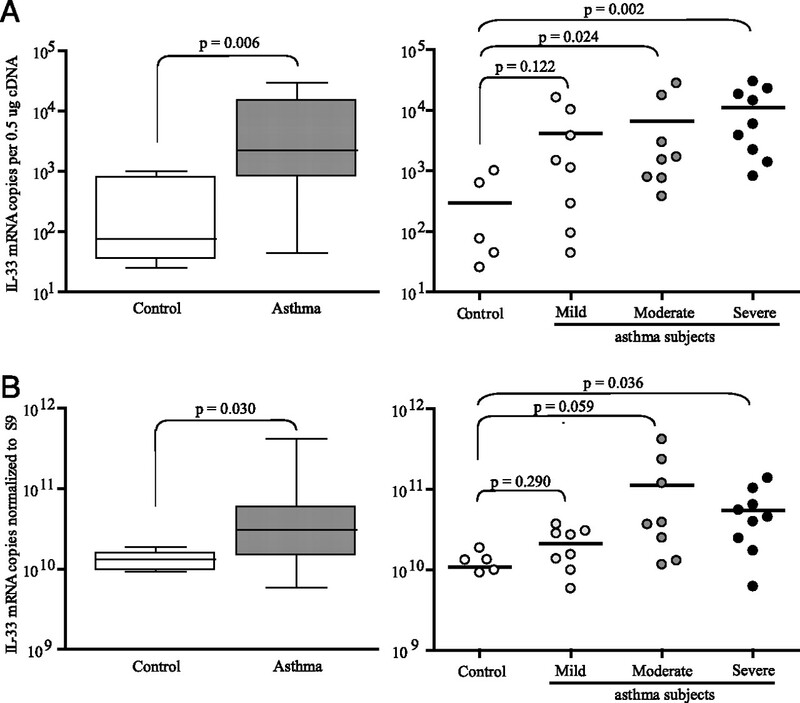 A, TNF-α/S9 mRNA ratios obtained from tissues from subjects with defined asthma severity are compared with those from controls. B, TNF-α/S9 mRNA ratios and IL-33/S9 mRNA ratios obtained from lung tissue specimens of subjects with asthma are analyzed for correlation. Data from control subjects were excluded from the Spearman correlation analysis. C, Normalized IL-33 gene expression failed to correlate with the FEV1 values from subjects with and without asthma. ∗ p < 0.05, representing significant differences in the expression compared with the control group or a significant correlation between variables. Expression of the IL-33 protein was also assessed by immunocytochemistry in endobronchial tissue sections of both control and asthmatic subjects from the previously reported cohort. Interestingly, positive staining of the ASMC bundles (Fig. 3⇓, black arrows) was observed in lung tissue specimens from asthmatic subjects (Fig. 3⇓, A, C, and E), which contrasted with the absence of staining in smooth muscle cells from control subjects (Fig. 3⇓, B, D, and F). Smooth muscle cells (Fig. 3⇓, black arrows), along with epithelial and endothelial cells (Fig. 3⇓, white arrows), appeared as the main cell phenotypes expressing IL-33 in the lung tissue. Preadsorption of the primary anti-human IL-33 Ab with the immunizing peptide (i.e., human rIL-33) was used as a control to assess specificity of the immunostaining; the immunoreactivity of ASMC bundles from the tissue specimen from a subject with asthma was completely abolished (Fig. 3⇓G). In situ IL-33 gene expression in ASMC bundles was further confirmed using LCM ASMC bundles from endobronchial tissue sections of asthmatic subjects (n = 4). cDNAs generated from microdissected ASMC bundles were analyzed by real-time PCR and agarose gel (Fig. 3⇓H). Real-time PCR amplification products (both IL-33 and S9 gene transcripts) from the LCM-captured ASMC of two asthmatic subjects display the presence of an IL-33-specific, 180-bp amplicon (Fig. 3⇓H, lanes labeled “LCM 1” and “LCM 2”). cDNA from cultured ASMC was used as a positive control for the presence of IL-33 transcripts (Fig. 3⇓H, lane labeled “ASMC”). IL-33 in endobronchial biopsy tissue sections from subjects with asthma; expression in smooth muscle cell bundles is shown. Lung tissue sections were processed by immunocytochemistry as described in Materials and Methods. 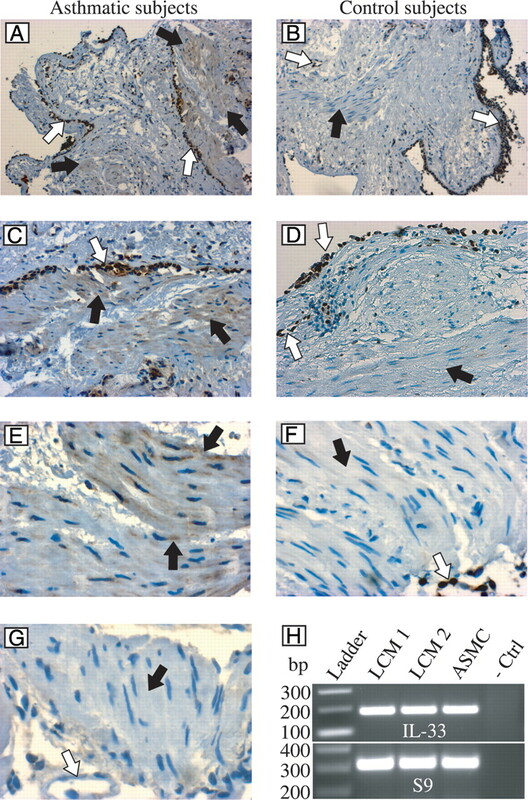 A–F, Representative examples of IL-33 immunohistochemistry of bronchial biopsies showing staining of smooth muscle cell bundles (black arrows) and epithelial or endothelial cells (white arrows) in subjects with asthma (A, C, and E) compared with smooth muscle cell bundles from healthy controls (B, D, and F) (original magnification: ×40 for A and B, ×200 for C and D, and ×400 for E and F). G, IL-33 staining of ASMC bundle and endothelial cells (see arrows) in a patient with moderate asthma was abolished by preadsorption of the primary Ab with immunizing peptide e.g., recombinant human IL-33. H, LCM ASMC bundles in lung tissue sections from subjects with asthma were processed for IL-33 gene expression profiling by RT-PCR as described in Materials and Methods, and real-time PCR amplification products were run on an agarose gel (lanes from left to right: DNA bp ladder (Ladder); LCM ASMC cDNA samples 1 (LCM 1) and 2 (LCM 2) from different asthma subjects; cDNA from cultured ASMC (ASMC); and no cDNA/negative amplification control (Ctrl)). In parallel to the increased IL-33 expression (protein and mRNA) in ASMC in the lung tissue from asthmatic subjects compared with healthy controls, we used primary ASMC grown in vitro to confirm their IL-33 expression and to modulate their IL-33 expression using the cytokines reported as being key players in lung inflammatory responses and asthma pathogenesis. As shown in Fig. 4⇓A, the screening of cDNA libraries prepared from various cell lines or tissues revealed that IL-33 mRNA is apparently expressed exclusively by nonhematopoietic and airway structural cells like fibroblasts, smooth muscle, and endothelial and epithelial cells. In Fig. 4⇓B, we observed that TNF-α and IFN-γ both up-regulated significantly IL-33 gene expression in ASMC grown for 24 h in the presence of increasing doses of recombinant cytokines (0.1–100 ng/ml). In contrast, the Th2 cytokines IL-4 and IL-13, along with TGF-β1, failed to up-regulate IL-33 gene expression in ASMC and even down-regulated IL-33 gene expression when applied at higher doses (10 and 100 ng/ml). The effect of the TNF-α cytokine was further shown to be time dependent (Fig. 4⇓C). Significant up-regulation of IL-33 gene transcription was observed as early as 4 h after stimulation with TNF-α. The up-regulation was significant until the 24-h time point, although a trend toward an increase was still visible after 48 and 72 h (p > 0.05 and data not shown, respectively). Time-dependent down-regulation of IL-33 mRNA by Th2 cytokines (IL-4 and IL-13) and TGF-β1 was confirmed after 24 and 48 h of stimulation (all cytokines were tested at 10 ng/ml; data not shown). IL-33 protein expression was confirmed by Western blotting using cell extracts from ASMC cultured for 24 h. Significant amounts of IL-33 protein (∼30 kDa) was expressed at baseline in medium-treated cells and was concomitantly detected in extracts from ASMC stimulated with TNF-α or IFN-γ cytokines (10 ng/ml; Fig. 5⇓A). Densitometric analysis of immunoblotting experiments revealed that only TNF-α could significantly increase IL-33 protein levels (Fig. 5⇓B). IL-33 cytokine release was further investigated by ELISA using supernatants from ASMC cultured with or without the various cytokines reported above. Interestingly, none of the conditions increased the levels of IL-33 detected in ASMC supernatants, which remained stable at ∼60.0 pg/ml after 1 h and up to 72 h of incubation with proinflammatory cytokines (Fig. 5⇓C). Finally, we addressed the question of whether the absence of variations in the release of IL-33 upon stimulation that increases its expression is due to the expression of ST2 receptor by ASMC, which would bind IL-33 and interfere with its detection in supernatants. ASMC were then stimulated for 24 h with TNF-α and IFN-γ, separately or in combination, in the presence or absence of 3 μg/ml neutralizing Ab against a human ST2 receptor possibly present either at the surface of ASMC or in the culture medium (in a soluble form; Fig. 5⇓D). Supernatants were then collected and an IL-33 ELISA revealed that ST2 receptors do not play role in the IL-33 release from ASMC. IL-33 gene expression in cytokine-stimulated primary ASMC grown in vitro. A, cDNA library obtained from different origins served for the assessment of IL-33 gene expression in various cell lines or tissues by RT-PCR. B, ASMC grown as described in Materials and Methods were stimulated using increasing concentrations of recombinant cytokines (0.1 to 100 ng/ml TNF-α, IFN-γ, TGF-β, IL-4, and IL-13) for 24 h (n = 3). C, IL-33 gene expression by ASMC time-dependently increased after stimulation with TNF-α (10 ng/ml) for 4–48 h (n = 5). Data are presented as means ± SEM. ∗, p < 0.05 compared with medium-treated ASMC. IL-33 cytokine expression and release in ASMC grown in vitro. A, IL-33 protein expression was detected by Western blotting (WB) in protein extracts from in vitro cultured ASMC for 24 h as described in Materials and Methods. IL-33 protein (∼30 kDa) was detected in all tested protein extracts (from right to left): medium-treated cells (Medium), TNF-α- (+ TNF-a) and IFN-γ (+ IFN-g)-treated cells, and protein ladder. This gel picture is representative of n = 3. B, Densitometric analysis of immunoblotting experiments conducted on ASMC extracts collected following 24 h of stimulation with the following cytokines at10 ng/ml: TNF-α, IL-4, IL-13, IFN-γ and TGF-β (n = 5). Med, Medium. C, IL-33 cytokine release was measured by ELISA using ASMC culture supernatants following stimulation of various cytokines (10 ng/ml) from 1 to 48 h (left graph) and up to 72 h poststimulation (right graph)). ELISA experiments were conducted as described in Materials and Methods. D, IL-33 ELISA was conducted with ASMC culture supernatants following 24 h of stimulation with cytokines with/without (black/gray bars) an excess (3 μg/ml) of neutralizing Ab against human ST2. ELISA data are presented as means ± SEM and are representative of data from at least two independent experiments. ∗, p < 0.05, compared with medium-treated ASMC. Based on the observations that only TNF-α and IFN-γ, when applied separately, successfully up-regulated IL-33 expression (Fig. 4⇑B), combinations of both cytokines were prepared and used to stimulate cultured ASMC for 24 h. As presented in Fig. 6⇓A, both cytokines applied separately significantly up-regulated IL-33 gene expression. Furthermore, stimulation of ASMC with a fixed concentration of TNF-α (10 ng/ml) and an increasing concentration of IFN-γ (0.1 to 100 ng/ml) demonstrated that the cytokine mixture has synergistic effects in promoting IL-33 transcription. 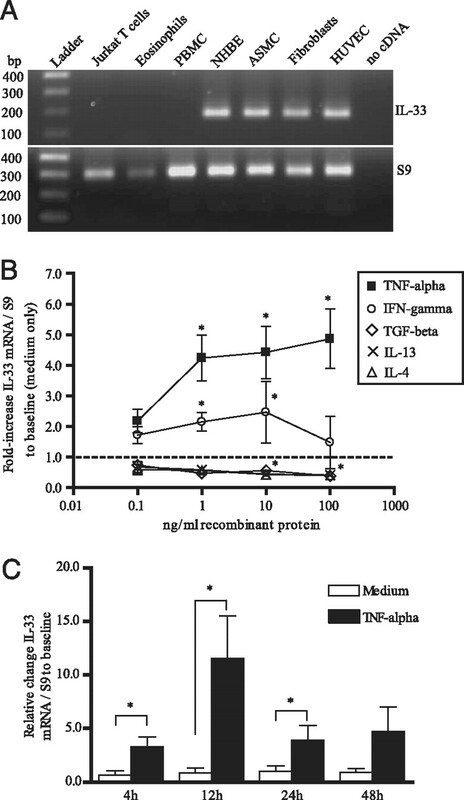 The addition of 1 ng/ml rIFN-γ to the TNF-α was sufficient to induce a significant potentiation of IL-33 expression, compared with TNF-α applied alone. Significant synergism was also observed at higher concentrations of IFN-γ (10 and 100 ng/ml) and was confirmed by densitometric analysis of Western blotting experiments (Fig. 6⇓B). In an attempt to link the latter in vitro experiments with the in vivo condition, investigation of the IFN-γ mRNA levels in lung tissues from subjects with asthma, as presented in Fig. 6⇓C, did not reveal any significant difference between subjects from the different groups with asthma (p > 0.05) due to large intersubject variability. Relationship between TNF-α and IFN-γ in modulating IL-33 expression in ASMC and IFN-γ expression in lung tissue from subjects with asthma. A, In vitro grown ASMC were stimulated with TNF-α (TNF-alpha; ng/ml) or TNF-α with increasing concentrations of IFN-γ (IFN-gamma; 0.1 to 100 ng/ml) for 24 h, and IL-33 gene expression was monitored by RT-PCR as previously described. Data are presented as means ± SEM; n = 3. B, Densitometric analysis of IL-33 immunoblotting experiments on ASMC extracts following 24 h of stimulation with TNF-α (TNF-a) and IFN-γ (IFN-g) alone or in combination (n = 3). C, IFN-γ mRNA level in endobronchial biopsy specimens from subjects with mild, moderate, and severe asthma (vs controls) was determined by RT-PCR as previously described. ∗, p < 0.05, representing statistically significant difference from TNF-α-treated ASMC. As presented in Fig. 4⇑, B and C, TNF-α induces an up-regulation of IL-33 mRNA in ASMC in both a dose- and time-dependent manner. Although the most potent effect of TNF-α on IL-33 transcription was observed after 12 h of stimulation, significant up-regulation was detected from 4 to 24 h. The latter time-point (24 h) was used to determine the effect of the pharmacological inhibitors on IL-33 expression in TNF-α stimulated ASMC. As shown in Fig. 7⇓A, addition of the corticosteroid DEX, even at increasing concentrations (0.001 to 10 μM), failed to significantly reduce the effect of TNF-α. In contrast, the addition of 100 and 250 nM DNA-binding protein inhibitor MMA, which binds GC-rich Sp1/Sp3 binding sites, significantly abrogated the effect of TNF-α on IL-33 transcription in ASMC (Fig. 7⇓B). Pharmacological inhibition of TNF-α-driven IL-33 up-regulation in primary ASMC. Both DEX (A) and MMA (B) were added at increasing concentrations (0.001–10 μM and 1–250 nM, respectively) to ASMC grown in vitro in the presence of TNF-α (TNF-alpha) for 24 h. Data are presented as means ± SEM; n = 3. ∗, p < 0.05, representing statistically significant difference from TNF-α-treated ASMC. The initial description of IL-33 as an IL-1-type cytokine associated with Th2 inflammation, both in vitro and in vivo (7), raises questions about its possible involvement in Th2-mediated airway diseases like asthma and allergic rhinitis. Although several studies using recombinant protein applied to leukocyte cultures and administered to animals support the role of IL-33 in the promotion of Th2-type immune response, no study to date has investigated its expression in the airways of human subjects with airway inflammatory diseases. Our study provides evidence that IL-33 gene expression is increased in lung tissues from asthmatic subjects. This increased expression was concomitant with disease severity, because only tissues from moderate and severe asthmatics showed a strong trend toward or had significant IL-33 up-regulation, respectively, compared with controls. Lung tissues from subjects with severe asthma displayed slightly reduced IL-33 expression compared with the moderate asthma group of subjects, although this did not reach statistical significance. One should note that subjects with severe asthma enrolled in this study were either treated with daily oral steroids for >50% of the previous 12 mo or treated continuously over the previous 12 mo with high-dose inhaled steroids and add-on therapy (long-acting β2 agonist, leukotriene receptor antagonist, or theophylline), all therapies that may regulate the expression of IL-33. As described previously (15), subjects with severe asthma also experienced frequent exacerbation of asthma. In comparison, subjects with moderate asthma were well controlled, either on at least 200 mg/day fluticasone or an equivalent (≤ 1000 mg/day with or without the use of a long acting β-agonist) or on oral steroids for no more than 30 days in the previous 12 mo. TNF-α mRNA levels in lung tissues also increased in subjects with asthma (moderate and severe) compared with nonasthmatic controls, reflecting an inflammatory state in both moderate and severe asthmatic subjects despite of their daily use of anti-inflammatory therapies. These data are in agreement with previous studies (21) that support a role for TNF-α in the pathogenesis of asthma. Interestingly, both IL-33 and TNF-α mRNA levels in the lung tissues of asthmatic subjects in our study were significantly correlated, which raised the question of possible interactions between the two proinflammatory cytokines. The effects of anti-inflammatory strategies on the expression of IL-33 in the asthmatic lung need to be studied. Although Schmitz and collaborators originally screened cDNA libraries in search of the cellular sources of the IL-33 cytokine, there has been as yet no study associating its expression to specific cell types in human Th2-type lung disease like asthma (7). Our data provide the novel observation that ASMCs are a source of the IL-33 cytokine in human asthma. We demonstrated IL-33 protein immunoreactivity in ASMC bundles of lung tissue sections from asthmatic subjects and not in those from normal controls. The immunostaining of lung tissue biopsies confirmed the expression of IL-33 by endothelial cells of the lung, which was previously reported in the intestine by Carriere and collaborators (9). We also observed IL-33 immunoreactivity in bronchial epithelial cells from both asthmatic and control subjects. Specificity of the immunocytochemistry was confirmed through preadsorption of the primary Ab directed against human IL-33 by using an excess of rIL-33 peptide, as well as through the use of an isotype control Ab (staining not shown). We confirmed IL-33 immunoreactivity seen in ASMC from asthmatic subjects by detecting IL-33 mRNA expression in laser-capture microdissected ASMC bundles excised from lung biopsy tissue sections of asthmatic subjects. In light of the in situ observations made in lung tissue from asthmatic subjects with regard to IL-33 and TNF-α expression, we further confirmed our data by using primary ASMC as an in vitro model. ASMC subjected to TNF-α effectively exhibited striking up-regulation of IL-33 gene expression in both a dose- and a time-dependent manner. This in vitro relationship between IL-33 and TNF-α supports the correlation observed between the two variables in the lung tissues of asthmatics. However, we failed to observe any correlation between IL-33 gene expression in the lung and the subject’s lung function as expressed by a FEV1 test (percentage predicted). In vitro studies of primary ASMC revealed that none of the proinflammatory recombinant Th2 cytokines IL-4 and IL-13 promoted the transcription of the IL-33 gene. Indeed, IL-4 and IL-13 even down-regulated IL-33 expression in a dose- and time-dependent manner. Although IL-33 was widely reported as a cytokine promoting the Th2 phenotype, the latter data suggest that IL-33 expression itself is not necessarily dependent on the Th2 cytokine milieu. In contrast, stimulation of ASMC with the key Th1 cytokine IFN-γ significantly increased IL-33 transcription. The ability of both TNF-α and IFN-γ to increase IL-33 expression is supported by numerous studies describing the effects of these proinflammatory cytokines on cultured ASMC, especially in the context of asthma pathogenesis. TNF-α was previously reported to increase ASMC production of GM-CSF (22) and that of various chemokines involved in leukocyte recruitment to the asthmatic airways such as CCL5/RANTES (23), CCL11/eotaxin (24), and CXCL8/IL-8 (25), but also the production of monocyte chemotactic proteins like CCL2/MCP-1 (26). Both TNF-α and IFN-γ augment Ca2+ fluxes and ASMC contractile response to agonists like bradykinin (27, 28). Our data regarding increased IL-33 gene expression under TNF-α- and IFN-γ-mediated conditions were similar to those from observations of IL-33 protein expression by Western blotting. Although IFN-γ slightly increased the amount of IL-33 protein detected in ASMC extracts, only TNF-α significantly augmented its expression. However, the assessment of IL-33 cytokine release using ELISA revealed that the IL-33 protein is poorly released outside ASMC, regardless of cytokine stimulation. Although no study has extensively described IL-33 receptor affinity (e.g., ST2) for IL-33 or which IL-33 concentration has biological relevance in the context of asthma, it should be noticed that only 1 ng/ml was sufficient to activate eosinophils in vitro (11). This suggests that the release of low amounts of IL-33 could be biologically relevant. Mast cells, Th2 cells, and eosinophils have all been shown to express a functional IL-33 receptor (10, 11, 12, 29). The lack of IL-33 release from stimulated ASMC was also confirmed when an excess of neutralizing Ab against human ST2 was added to the cultures, which ensures that IL-33 release from ASMC to is not affected by a possible binding to ST2 on the cells or in the supernatant. Furthermore, a recent but yet unpublished observation that ASMC failed to respond to IL-33 suggests that ST2 expression in these cells is not likely to affect IL-33 levels in cell supernatants (30). Conversely, such poor release of IL-33 by ASMC reinforces the hypothesis that this cytokine could be stored and/or play intracellular roles similar to those of other IL-1 type cytokines (especially IL-1α) inside IL-33-producing cells (31). The intracellular detection of IL-33 in cultured ASMC (by immunoblotting) is further supported by data published by Dr Girard’s laboratory (9, 32) that present IL-33 as a nuclear factor typically expressed in endothelial cells. IL-33 was shown to be associated with heterochromatin in the nucleus. Interestingly, the stimulation of cultured ASMC with a combination of TNF-α and IFN-γ revealed their synergistic ability to up-regulate IL-33 mRNA and protein expression compared with their separate effects. These data were similar to those of a previous observation that IFN-γ applied alone fails to promote CCL5 production in ASMC but can synergize with and potentiate TNF-α-induced CCL5 production (23). IFN-γ gene expression in the bronchial biopsy tissue from asthmatic subjects did not increase with disease severity, which is in agreement with most of the literature in the field of atopic asthma (1). The synergistic effect of TNF-α and IFN-γ in increasing IL-33 expression suggests that even limited release of the Th1 cytokine IFN-γ is sufficient at potentiating the TNF-α-induced IL-33 expression by ASMC. Furthermore, there is growing evidence that a subset of subjects with severe asthma exhibit features of Th1 cell-driven inflammation when compared with Th2-biased mild and moderate asthmatics, as described by an increased presence of IFN-γ and CXCL8-positive cells (33). Our pharmacological inhibition experiments demonstrated the failure of DEX in contrast to the high efficiency of MMA to significantly reduce the TNF-α-driven up-regulation of IL-33 expression in cultured ASMC. These results are relevant to the subset of subjects with more severe asthma who are refractory to corticosteroid therapy and exhibit features of TNF-α-driven inflammation (3). Modulation of IL-33 expression by TNF-α suggests a contribution of IL-33 to the refractory phenotype of certain asthmatic subjects treated with corticosteroids. The abrogation of TNF-α-induced IL-33 expression obtained following MMA treatment of ASMC, along with the strong correlation between the mRNA levels of the two cytokines in lung tissues, together suggest that their expression is closely related. Nonetheless, the increased IL-33 and TNF-α mRNA levels observed in tissues from subjects with moderate asthma compared with those from the severe asthma group suggest that steroids and/or possibly add-on therapies are somewhat relatively efficient at reducing the expression of inflammatory cytokines in the lungs of asthmatics. Finally, such association between TNF-α and IL-33 is of particular interest in the context of the possible benefits of anti-TNF-α in treating asthma (5). Although the clinical trials addressing the efficiency of anti-TNF-α therapy have so far yielded controversial data (34), there is some evidence that TNF-α would especially play a role in the pathogenesis of severe and refractory asthma (3, 21, 35). The demonstration of IL-33 expression by ASMC in the lungs of asthmatic subjects is also relevant in the context of airway remodeling. There is extensive evidence of an increased and hyperproliferative airway smooth muscle mass surrounding the airways of subjects with asthma (36, 37). Such abundance of ASMC in the bronchial parenchyma is thus likely to contribute to airway hyper-reactivity and hyper-responsiveness (e.g., enhanced contractility), but also to the inflammatory response (e.g., production of IL-33) in the presence of stimuli, including TNF-α and IFN-γ (28). The increased ASM mass widely reported in the remodeled airways of subjects with moderate to severe asthma also provides an interesting hypothesis to explain any increase in the release of the IL-33 cytokine by cultured ASMC. The relative contribution of other cell phenotypes expressing IL-33 in the asthmatic lung tissue (e.g., endothelial and epithelial cells) definitely deserves attention. Numerous studies have indeed described the extent of epithelial and endothelial remodeling in asthma. Bronchial epithelia of the asthmatic airways can be severely damaged and/or display extensive thickening due to abnormal repair (38), whereas the vascular changes associated with asthma mostly regroup an increased permeability and angiogenesis (39). In contrast to the current view that allergic inflammatory mediators arise mainly from hematopoietic cells (lymphocytes and granulocyte s), our findings on IL-33 in human asthma support the increasing role of structural cells in the production of pro-Th2 cytokines. Although this study does not address the relative contribution of epithelial and endothelial cells and ASMC to the IL-33 pool in the lung, it stresses that resident and structural cells like ASMC may play roles in the development and maintenance of inflammatory responses via the IL-33 axis. Binding of IL-33 to the membrane-bound IL-1 type receptor ST2 (ST2L) on immune cells of the lung parenchyma triggers the production of Th2 cytokines and mediators (like chemokines) that are described as important contributors to the clinical features of asthma (7, 11, 40). In vivo studies reported that a specific blockade of ST2L severely impaired Th2 immunity, without affecting Th1 immune responses (41, 42, 43, 44). Furthermore, IL-33 expression in the lung and various tissues was increased by Ag challenge in a mouse model of allergic asthma (8). IL-33 could act as a feedback cytokine released by structural cells under certain inflammatory conditions (including TNF-α, IFN-γ cytokines), activating and recruiting inflammatory cells in the asthmatic airways, respectively. Studies have reported the presence of activated mast cells infiltrating smooth muscle bundles in the airway parenchyma of asthmatic subjects (45), and IL-33 has been shown to promote the recruitment of Th2 lymphocytes in both in vivo and in vitro experiments (12). Considered together, previous studies on the biological functions of IL-33 on ST2-expressing cells and its increased expression in a mouse model of allergic airway inflammation have raised questions regarding its possible implications in asthma (7, 8). This study reports an increased expression of the cytokine IL-33 in human asthma, along with TNF-α expression, and mainly in the more severe phenotypes of the disease. Our data point at airway smooth muscle cells as a source of IL-33 in asthmatic lung tissue. We describe the regulation of IL-33 expression in ASMC (e.g., up-regulation by TNF-α and IFN-γ, but not by Th2 cytokines), and these data suggest that IL-33 is poorly released under cytokine-induced, in vitro inflammatory conditions. Studies on the effect of anti-inflammatory drugs on IL-33 in vitro expression finally suggest its possible implication in severe and refractory asthma, whereas DEX failed to abrogate TNF-α-induced IL-33 expression. Considering the published literature on the biological functions of IL-33, this study supports the potential effect of IL-33 expression in human asthma. We thank Dr. Philippe Joubert, Andrea K. Mogas, Sawsan Al-Mot, and Elsa Schotman for valuable advice and technical support in the course of this study. ↵1 This study was supported by the J. T. Costello Memorial Fund and the Richard and Edith Strauss Canada Foundation. Q.H. is a recipient of McGill University Health Center Strauss Chair in Respiratory Medicine. D.P. is a recipient of an doctoral studentship from the Fonds de la Recherche en Santé du Québec. ↵3 Abbreviations used in this paper: ASMC, airway smooth muscle cell; DEX, dexamethasone 21-phosphate disodium salt; FEV1, forced expiratory volume in 1 s; LCM, laser capture microdissection/microdissected; MMA, mithramycin A.
Robinson, D. S., Q. Hamid, S. Ying, A. Tsicopoulos, J. Barkans, A. M. Bentley, C. Corrigan, S. R. Durham, A. B. Kay. 1992. Predominant TH2-like bronchoalveolar T-lymphocyte population in atopic asthma. N. Engl. J. Med. 326: 298-304. Ying, S., D. S. Robinson, V. Varney, Q. Meng, A. Tsicopoulos, R. Moqbel, S. R. Durham, A. B. Kay, Q. Hamid. 1991. TNFα mRNA expression in allergic inflammation. Clin. Exp. Allergy 21: 745-750. Berry, M. A., B. Hargadon, M. Shelley, D. Parker, D. E. Shaw, R. H. Green, P. Bradding, C. E. Brightling, A. J. Wardlaw, I. D. Pavord. 2006. Evidence of a role of tumor necrosis factor α in refractory asthma. N. Engl. J. Med. 354: 697-708. Berry, M., C. Brightling, I. Pavord, A. Wardlaw. 2007. TNF-α in asthma. Curr. Opin. Pharmacol. 7: 279-282. Brightling, C., M. Berry, Y. Amrani. 2008. Targeting TNF-α: a novel therapeutic approach for asthma. J. Allergy. Clin. Immunol. 121: 5-10. Dinarello, C. A.. 2005. An IL-1 family member requires caspase-1 processing and signals through the ST2 receptor. Immunity 23: 461-462. Hayakawa, H., M. Hayakawa, A. Kume, S. Tominaga. 2007. Soluble ST2 blocks interleukin-33 signaling in allergic airway inflammation. J. Biol. Chem. 282: 26369-26380. Carriere, V., L. Roussel, N. Ortega, D. A. Lacorre, L. Americh, L. Aguilar, G. Bouche, J. P. Girard. 2007. IL-33, the IL-1-like cytokine ligand for ST2 receptor, is a chromatin-associated nuclear factor in vivo. Proc. Natl. Acad. Sci. USA 104: 282-287. Allakhverdi, Z., D. E. Smith, M. R. Comeau, G. Delespesse. 2007. Cutting edge: The ST2 ligand IL-33 potently activates and drives maturation of human mast cells. J. Immunol. 179: 2051-2054. Cherry, W. B., J. Yoon, K. R. Bartemes, K. Iijima, H. Kita. 2008. A novel IL-1 family cytokine. IL-33, potently activates human eosinophils. J. Allergy Clin. Immunol. 121: 1484-1490. Komai-Koma, M., D. Xu, Y. Li, A. N. McKenzie, I. B. McInnes, F. Y. Liew. 2007. IL-33 is a chemoattractant for human Th2 cells. Eur. J. Immunol. 37: 2779-2786. American Thoracic Society (ATS). 2000. Proceedings of the ATS workshop on refractory asthma: current understanding, recommendation. unanswered questions. Am. J. Resp. Crit. Care Med. 162: 2341-2351. American Thoracic Society. 1987. Standards for the diagnosis and care of patients with chronic obstructive pulmonary disease (COPD) and asthma. This official statement of the American Thoracic Society was adopted by the ATS Board of Directors, November 1986. Am. Rev. Respir. Dis. 136: 225-244. Foley, S. C., A. K. Mogas, R. Olivenstein, P. O. Fiset, J. Chakir, J. Bourbeau, P. Ernst, C. Lemiere, J. G. Martin, Q. Hamid. 2007. Increased expression of ADAM33 and ADAM8 with disease progression in asthma. J. Allergy Clin. Immunol. 119: 863-871. Giaid, A., R. P. Michel, D. J. Stewart, M. Sheppard, B. Corrin, Q. Hamid. 1993. Expression of endothelin-1 in lungs of patients with cryptogenic fibrosing alveolitis. Lancet 341: 1550-1554. Hauber, H. P., P. Daigneault, S. Frenkiel, F. Lavigne, H. L. Hung, R. C. Levitt, Q. Hamid. 2005. Niflumic acid and MSI-2216 reduce TNF-α-induced mucin expression in human airway mucosa. J. Allergy Clin. Immunol. 115: 266-271. Lajoie-Kadoch, S., P. Joubert, S. Letuve, A. J. Halayko, J. G. Martin, A. Soussi-Gounni, Q. Hamid. 2006. TNF-α and IFN-γ inversely modulate expression of the IL-17E receptor in airway smooth muscle cells. Am. J. Physiol. 290: L1238-L1246. Naureckas, E. T., I. M. Ndukwu, A. J. Halayko, C. Maxwell, M. B. Hershenson, J. Solway. 1999. Bronchoalveolar lavage fluid from asthmatic subjects is mitogenic for human airway smooth muscle. Am. J. Respir. Crit. Care Med. 160: 2062-2066. Howarth, P. H., K. S. Babu, H. S. Arshad, L. Lau, M. Buckley, W. McConnell, P. Beckett, M. Al Ali, A. Chauhan, S. J. Wilson, et al 2005. Tumour necrosis factor (TNFα) as a novel therapeutic target in symptomatic corticosteroid dependent asthma. Thorax 60: 1012-1018. Saunders, M. A., J. A. Mitchell, P. M. Seldon, M. H. Yacoub, P. J. Barnes, M. A. Giembycz, M. G. Belvisi. 1997. Release of granulocyte-macrophage colony stimulating factor by human cultured airway smooth muscle cells: suppression by dexamethasone. Br. J. Pharmacol. 120: 545-546. John, M., S. J. Hirst, P. J. Jose, A. Robichaud, N. Berkman, C. Witt, C. H. Twort, P. J. Barnes, K. F. Chung. 1997. Human airway smooth muscle cells express and release RANTES in response to T helper 1 cytokines: regulation by T helper 2 cytokines and corticosteroids. J. Immunol. 158: 1841-1847. Ghaffar, O., Q. Hamid, P. M. Renzi, Z. Allakhverdi, S. Molet, J. C. Hogg, S. A. Shore, A. D. Luster, B. Lamkhioued. 1999. Constitutive and cytokine-stimulated expression of eotaxin by human airway smooth muscle cells. Am. J. Respir. Crit. Care Med. 159: 1933-1942. John, M., B. T. Au, P. J. Jose, S. Lim, M. Saunders, P. J. Barnes, J. A. Mitchell, M. G. Belvisi, K. F. Chung. 1998. Expression and release of interleukin-8 by human airway smooth muscle cells: inhibition by Th-2 cytokines and corticosteroids. Am. J. Respir. Cell Mol. Biol. 18: 84-90. Watson, M. L., S. P. Grix, N. J. Jordan, G. A. Place, S. Dodd, J. Leithead, C. T. Poll, T. Yoshimura, J. Westwick. 1998. Interleukin 8 and monocyte chemoattractant protein 1 production by cultured human airway smooth muscle cells. Cytokine 10: 346-352. Amrani, Y., R. A. Panettieri, Jr, N. Frossard, C. Bronner. 1996. Activation of the TNFα-p55 receptor induces myocyte proliferation and modulates agonist-evoked calcium transients in cultured human tracheal smooth muscle cells. Am. J. Respir. Cell Mol. Biol. 15: 55-63. Deshpande, D. A., T. F. Walseth, R. A. Panettieri, M. S. Kannan. 2003. CD38/cyclic ADP-ribose-mediated Ca2+ signaling contributes to airway smooth muscle hyper-responsiveness. FASEB J. 17: 452-454. Ho, L. H., T. Ohno, K. Oboki, N. Kajiwara, H. Suto, M. Iikura, Y. Okayama, S. Akira, H. Saito, S. J. Galli, S. Nakae. 2007. IL-33 induces IL-13 production by mouse mast cells independently of IgE-FcεRI signals. J. Leukocyte Biol. 82: 1481-1490. Roussel, L., M. Erard, C. Cayrol, J. P. Girard. 2008. Molecular mimicry between IL-33 and KSHV for attachment to chromatin through the H2A-H2B acidic pocket. EMBO Rep. 9: 1006-1012. Shannon, J., P. Ernst, Y. Yamauchi, R. Olivenstein, C. Lemiere, S. Foley, L. Cicora, M. Ludwig, Q. Hamid, J. G. Martin. 2008. Differences in airway cytokine profile in severe asthma compared to moderate asthma. Chest 133: 420-426. Wenzel, S. E., P. J. Barnes, E. R. Bleecker, J. Bousquet, W. Busse, S. E. Dahlen, S. T. Holgate, D. A. Meyers, K. F. Rabe, A. Antczak, et al 2009. Am. J. Respir. Crit. Care Med. 179: 549-558. Erin, E. M., B. R. Leaker, G. C. Nicholson, A. J. Tan, L. M. Green, H. Neighbour, A. S. Zacharasiewicz, J. Turner, E. S. Barnathan, O. M. Kon, et al 2006. The effects of a monoclonal antibody directed against tumor necrosis factor-α in asthma. Am. J. Respir. Crit. Care Med. 174: 753-762. Amishima, M., M. Munakata, Y. Nasuhara, A. Sato, T. Takahashi, Y. Homma, Y. Kawakami. 1998. Expression of epidermal growth factor and epidermal growth factor receptor immunoreactivity in the asthmatic human airway. Am. J. Respir. Crit. Care Med. 157: 1907-1912. Roth, M., P. R. Johnson, P. Borger, M. P. Bihl, J. J. Rudiger, G. G. King, Q. Ge, K. Hostettler, J. K. Burgess, J. L. Black, M. Tamm. 2004. 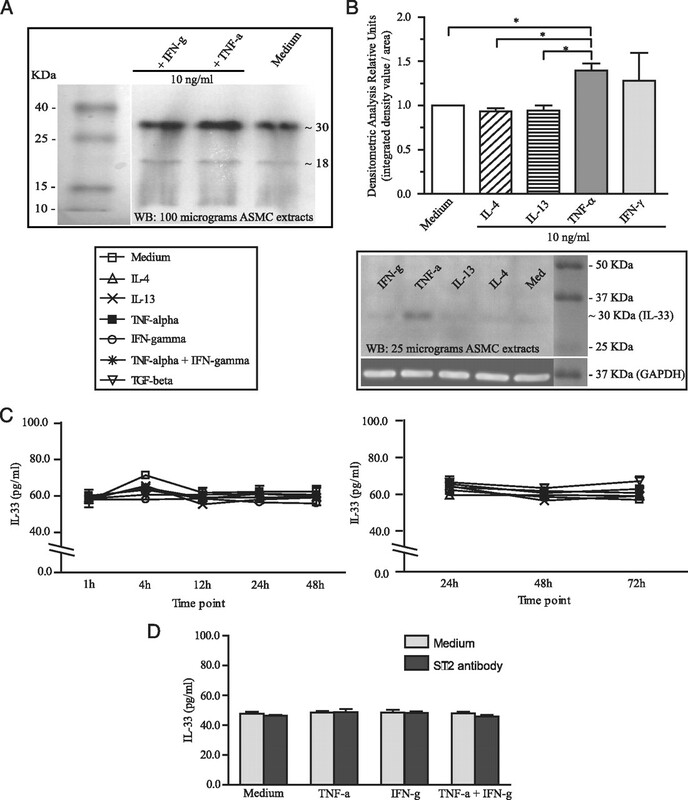 Dysfunctional interaction of C/EBPα and the glucocorticoid receptor in asthmatic bronchial smooth-muscle cells. N. Engl. J. Med. 351: 560-574. Hackett, T. L., D. A. Knight. 2007. The role of epithelial injury and repair in the origins of asthma. Curr. Opin. Allergy Clin. Immunol. 7: 63-68. Paredi, D., P. J. Barnes. 2009. The airway vasculature: recent advances and clinical implications. Thorax 64: 444-450. Moulin, D., O. Donze, D. Talabot-Ayer, F. Mezin, G. Palmer, C. Gabay. 2007. Interleukin (IL)-33 induces the release of proinflammatory mediators by mast cells. Cytokine 40: 216-225. Lohning, M., A. Stroehmann, A. J. Coyle, J. L. Grogan, S. Lin, J. C. Gutierrez-Ramos, D. Levinson, A. Radbruch, T. Kamradt. 1998. T1/ST2 is preferentially expressed on murine Th2 cells, independent of interleukin 4, interleukin 5, and interleukin 10, and important for Th2 effector function. Proc. Natl. Acad. Sci. USA 95: 6930-6935. Coyle, A. J., C. Lloyd, J. Tian, T. Nguyen, C. Erikkson, L. Wang, P. Ottoson, P. Persson, T. Delaney, S. Lehar, et al 1999. Crucial role of the interleukin 1 receptor family member T1/ST2 in T helper cell type 2-mediated lung mucosal immune responses. J. Exp. Med. 190: 895-902. Hoshino, K., S. Kashiwamura, K. Kuribayashi, T. Kodama, T. Tsujimura, K. Nakanishi, T. Matsuyama, K. Takeda, S. Akira. 1999. The absence of interleukin 1 receptor-related T1/ST2 does not affect T helper cell type 2 development and its effector function. J. Exp. Med. 190: 1541-1548. Townsend, M. J., P. G. Fallon, D. J. Matthews, H. E. Jolin, A. N. McKenzie. 2000. T1/ST2-deficient mice demonstrate the importance of T1/ST2 in developing primary T helper cell type 2 responses. J. Exp. Med. 191: 1069-1076.